South Africa is conducting its once-in-10-years census from 9 to 31 October 2011. Today, when I was walking home from the supermarket, two census people walked in the street where I live looking for people to count, but seemingly not having much luck as few people were at home or unwilling. (Regarding the latter, Hayibo already has been poking fun at the news updates on Census 2011.) They were fine with questioning me on the street as they missed me earlier and it saved them walking back another 200m in the hot sun or repeat visits in the hope I’d be home. First, there were the usual questions, like name, age, marital status, country and province of birth, since when I live in South Africa, and so forth. And then the census person kind of anticipated my response on what my first language is. “English”. “No”. “You sound as if it is”. “Oh. It really isn’t”. So, ‘other’ was ticked, and English as second language. I protested slightly, as the first words and coherent sentence I uttered in another language than my first were in French, and then German, and then English, and then Spanish, and then Italian, and then Zulu. The form did not cater for that. My mind started wandering off to database design and accuracy of the data. Ah, well. Then there was the race question. Not that I have figured it out how it works here, and after this event, even less so. For instance, some students who look definitely Mediterranean to me, are proudly Indian, and some people who have a pale skin complexion assert vehemently they are Coloured. So I thought I’d better not bother start trying to box anyone (including myself). But the question had to be answered. The census person read aloud the question: “Are you Black, Indian, or Coloured?”. “Uh, huh?”, turning my head to see the question on the sheet, which had five possible answers. Again, “Are you Black, Indian, or Coloured?”. “Uhm, I’m from Europe. European?”. “Ok, ‘other’”, which was ticked off, and that’s fine by me. Somehow, ‘White’, whilst being in the list, was, to her, not an option worth mentioning and considering to tick off, as apparently I am clearly not White. South Africans with as much of a melanin deficiency as me start their phrases every now and then with “we Europeans…[fill in anything that doesn’t hold for all Europeans]”; are they the Real WhitesTM? And, by converse, I am a Real EuropeanTM, who is then, by definition, not White? Confusing. The remaining questions were fairly standard, or sensible to ask in a country like South Africa (e.g., in the Netherlands, they would not ask whether I have piped water and am connected to the electricity grid; here, many still have to make do without). I am still wondering about the whole list of equipment though. That the census wants to know whether I have radio, TV, and Internet access at home makes sense in the light of information dissemination, but what’s so useful about knowing who has a DVD player? In the light of COP17 next month, it would have been nice if they had included ‘bicycle’ in the list, instead of only ‘motorcar’. There was no question about how one travels to work and how long it takes, although the answers could have been useful in the planning of the country’s infrastructure. I got two barcode-stickers at the end: one for the door and one for my passport. The first one acts alike the ‘no Jehovahs, Evangelists, door-to-door salesmen etc.’ stickers one can observe on several front doors in some European countries, the second one for cross-checking that I will not be counted twice or not at all. It’ll be interesting to see what the statisticians are going to do with all the data. It has been a busy month of conferencing. First was AFRICON’11 in Livingstone in Zambia (13-15 Sept.) and its special session on Robotics and AI in Africa, where I presented a paper on bottom-up ontology development of bio-ontologies ). Then the Masters AI spring School (MAIS’11) hosted by UKZN (26-30 Sept.), of which I was the main organizer and where I gave a presentation on ontology-driven formal conceptual data modeling for biological data analysis. And I just returned from the South African Institute of Computer Scientists and Information Technologists Annual Research Conference (SAICSIT’11) in Cape Town (3-5 Oct.), where I presented two papers (also blogged about before: on rough subsumption reasoning  and keys in UML class diagrams ). The remainder of this post contains a quick recap of each. I think back at this conference with mixed emotions: the logistics were quite lousy and very expensive, but I’ve made several new connections and it was good to be informed about who’s working on what in Africa. Overall, and going by the sessions I attended, it gave me the impression of a workshop-level event rather than ‘the’ major conference on the continent it is claimed to be. Looking through my notes now, some of the noteworthy items are Dietmar Dietrich’s keynote on the questions if IT is to/can be a major contributor to solve the energy challenge. (Green IT seems to be the new up and coming hot topic in research and engineering.). The Robotics and AI sessions and dialog session I attended had several showcases of robots, Tracey Booysen from UCT presented how to build the, thus far cheapest, swarm robot (60 USD) , and Alexander Ferrein described the experiment of high school students preparing and participating in Robocup Junior . Other topics were as diverse as smart carpets, water quality monitoring with live sensors made from algae, the role (if any) for robotics in sustainable development, and ubiquitous healthcare with mobile phones. Slightly off-topic: the walk at the top of the Victoria Falls was doable even for me and the microlight flight over the falls was great. MAIS followed three previous yearly winter/spring schools (MOWS’08, MOSS’09, MOWS’10), though this time it was held in Durban instead of Pretoria and the scope was broader than ontologies. Alessandro Artale, from my former employer the Free University of Bozen-Bolzano, gave his Formal Methods course to participants from UKZN, UNISA, CSIR-Meraka, and UP in the mornings, augmenting the theoretical aspects with practical’s with NuSMV in the labs, and he closed with recent results on formal temporal conceptual data modelling with light-weight temporal DLs. The afternoons were filled with tutorials and research presentations. Nelishia Pillay from UKZN gave a well-prepared tutorial on hyper heuristics and Sergio Tessaris, also from FUB, gave a tutorial on SAT and efficient Boolean reasoning (online abstracts). The research presentations by students and researchers covered topics such as formal conceptual data modeling, non-monotonic reasoning, event processing of video, ICT for the sugar cane supply chain, belief revision, foundational ontologies, optimization, and digital forensics. We were short on time with all sessions and continued the discussions during the breaks. Hopefully the ongoing research activities and new ideas the participants were exposed to and exchanged with each other will lead to fruitful collaboration. UPDATE (17-10): Phumelele Mavaneni, intern journalist from the UKZN Online e-newspaper, wrote an article about MAIS’11 (vol 5, issue 39), and on the right is a group photo with some of the participants. It was my first SAICSIT attendance, and it gave me a positive impression, both regarding papers presented and the people who attended. The event was quite selective with a 33% acceptance rate for full papers and 20% for short papers. The ambiance of the venue was good to meet the few people I’d met before and become acquainted with fellow CS & IT researchers and the system in South Africa. The sessions were ‘mixed’, in that a talk about, say, static typing with value space-based subtyping  was followed by media download in South African taxis , and software-defined radio , classifier fusion strategies , and an ICT for rural development evaluation framework  were all put in the same session. The shift was a bit odd at times, but it also contributed to a broader-than-usual exposure of CS and IT research. Caroline Pade-Khene was actually quite skeptical about ICT4D—or: it is at best a “working hypothesis” —which partially shone through some of the ICT4D paper presentations; it is not easy to figure out what to measure, how, and even the kinds of things being measured are changing over time. And gathering empirical data is time-consuming and faces unexpected obstacles, as Gary Marsden described in his entertaining presentation about the media downloads . My own papers [2, 3] were on the theory-side of CS & IT, were well-received, and ‘brought out in the open’ a couple of attendees with an interest in ontologies. Now it’s back to the regular activities of, mainly, teaching theory of computation and researching so as to have some results for the upcoming submission deadline season (and also to submit that journal paper). Keet CM. Bottom-up ontology development reusing semi-structured life sciences diagrams. AFRICON’11 — Special Session on Robotics and Artificial Intelligence in Africa, Livingstone, Zambia 13-15 September, 2011. IEEE Xplore. Keet, C.M. Rough Subsumption Reasoning with rOWL. SAICSIT Annual Research Conference 2011 (SAICSIT’11), Cape Town, South Africa, October 3-5, 2011. ACM Conference Proceedings, pp 133-140. Keet, C.M. Enhancing Identification Mechanisms in UML Class Diagrams with Meaningful Keys. SAICSIT Annual Research Conference 2011 (SAICSIT’11), Cape Town, October 3-5, 2011. ACM Conference Proceedings, pp 283-286. Booysen, T., Rieger, M., Ferrein, A. Towards inexpensive robots for science & technology teaching and education in Africa. AFRICON’11 — Special Session on Robotics and Artificial Intelligence in Africa, Livingstone, Zambia 13-15 September, 2011. IEEE Xplore. 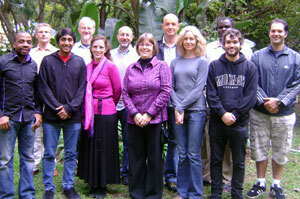 Ferrein, A., Marais, S., Potgieter, A., Steinbauer, G. Robocup Junior: a vehicle for S&T education in Africa? AFRICON’11 — Special Session on Robotics and Artificial Intelligence in Africa, Livingstone, Zambia 13-15 September, 2011. IEEE Xplore. Paar, A., Gruner, A. Static typing with value space-based subtyping. SAICSIT Annual Research Conference 2011 (SAICSIT’11), Cape Town, South Africa, October 3-5, 2011. ACM Conference Proceedings, pp 177-186. Smith, G., Marsden, G. Providing media download services in African taxis. SAICSIT Annual Research Conference 2011 (SAICSIT’11), Cape Town, South Africa, October 3-5, 2011. ACM Conference Proceedings, pp 215-223. Winberg, S., Langman, A., Scott, S. The RHINO Platform – Charging towards innovation and skills development in software defined radio. SAICSIT Annual Research Conference 2011 (SAICSIT’11), Cape Town, South Africa, October 3-5, 2011. ACM Conference Proceedings, pp 334-337. Lutu, P.E.N. Empirical comparison of four classifier fusion strategies for positive-versus-negative ensembles. SAICSIT Annual Research Conference 2011 (SAICSIT’11), Cape Town, South Africa, October 3-5, 2011. ACM Conference Proceedings, pp 302-305. Pade-Khene, C., Sewry, D. Proposed Stages of a Rural ICT Comprehensive Evaluation Framework in ICT for Rural Development Projects. SAICSIT Annual Research Conference 2011 (SAICSIT’11), Cape Town, South Africa, October 3-5, 2011. ACM Conference Proceedings, pp 326-329.